Peter Booth is one of the key figures of Australian art in the late 20th century, whose dark, sometimes apocalyptic, paintings are charged with an intense emotional power and with symbolic meaning. ‘Peter Booth is possibly Australia’s most accomplished and respected figurative painter – I certainly think so,’ says Paul Ryan. Born in Sheffield in England in 1940, the son of a steelworker, Booth came to Australia with his family in 1957. He worked with his father in the steel mills until going to the National Gallery School in 1962 to study painting. He came to prominence in the 1960s with a series of minimalist black abstract paintings. By the late 1970s he had moved to nightmarish figurative paintings featuring monstrous allegories involving cannibalism, war scenes and mutilated bodies. Known for his visionary Australian landscapes, both urban and rural, Booth painted a series of snowy winter scenes in the 1990s after a trip to Russia. 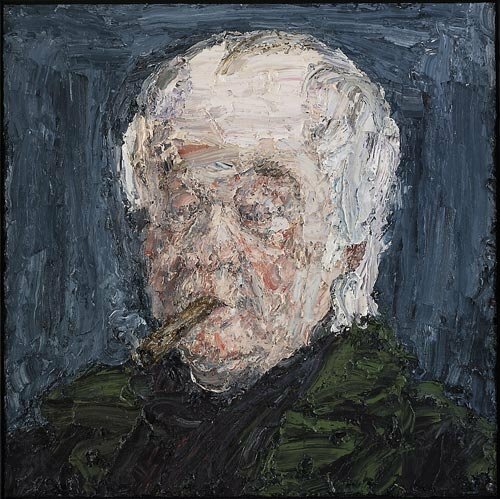 The shy artist, who uses lashings of thick paint and always has a cigar clamped between his teeth, was the subject of a major retrospective called Human/Nature at the Ian Potter Centre: NGV Australia at Federation Square in 2003/2004. His works are held in the National Gallery of Australia and all the other state galleries as well as in the Metropolitan Museum of Modern Art and the Solomon R Guggenheim Museum in New York. Born in Auckland in 1964, Ryan moved to Australia as a child. He went to school in Australia, New Zealand, America and England and did a Bachelor of Creative Arts at the University of Wollongong. He has had regular solo exhibitions since 1988 and has exhibited in many group shows including the Blake Prize, the Dobell Prize, the Sulman Prize, the Fleurieu Landscape Prize, the Wynne Prize and the Sulman Prize. He has won eight art prizes including the 2006 Fleurieu Peninsula Art of Food and Wine Prize and the Faber Castell Drawing Prize. This is his seventh time in the Archibald Prize.